Here in the Pacific Northwest, we are known for our love of coffee. It’s not uncommon to have multiple Starbucks just blocks away from each other. There is also an abundant number of locally-owned coffee shops. If you love coffee as much as a Seattleite, making soap is a great way to include the ingredient in your products. 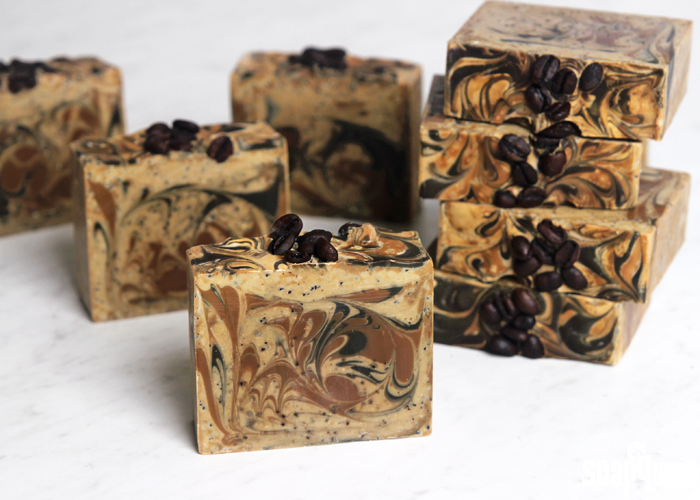 In this coffee soap project, locally roasted coffee is used to really make these bars special. Using a local ingredient highlights the handmade aspect of your products. 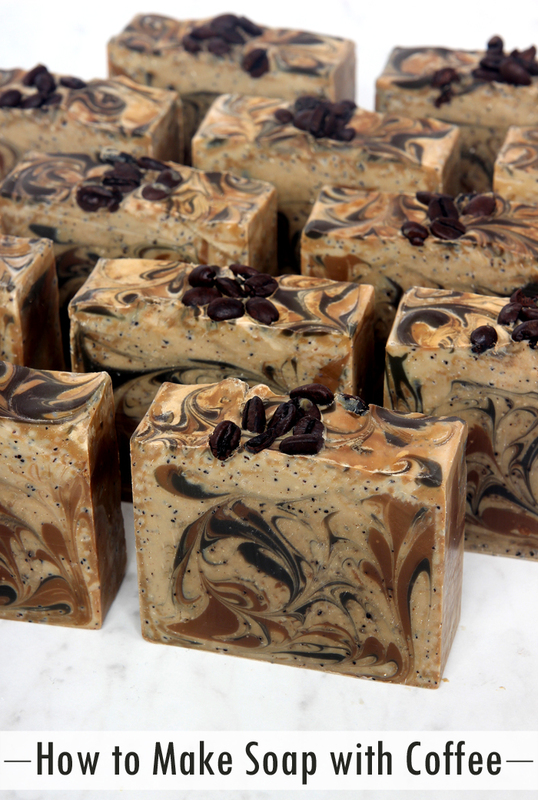 Incorporating coffee into cold process soap is easier than you might think. The distilled water in cold process recipes can be swapped for plain coffee. The key is using distilled water to brew the coffee, and allowing the coffee to cool to room temperature before adding sodium hydroxide lye. Using coffee instead of water makes the soap batter quite dark, so keep that in mind when choosing the color palette. If you’re using plain brewed coffee, don’t worry about the soap overheating. Black coffee does not contain sugar. Using coffee instead of water does not give soap a coffee smell. In fact, when you mix lye with coffee it does not smell very pleasant. This is because the lye “scorches” the coffee, resulting in a noticeable odor. The smell of the coffee and lye solution is usually not noticeable in the final bar. This is especially true if you’re using a fragrance oil in your recipe. 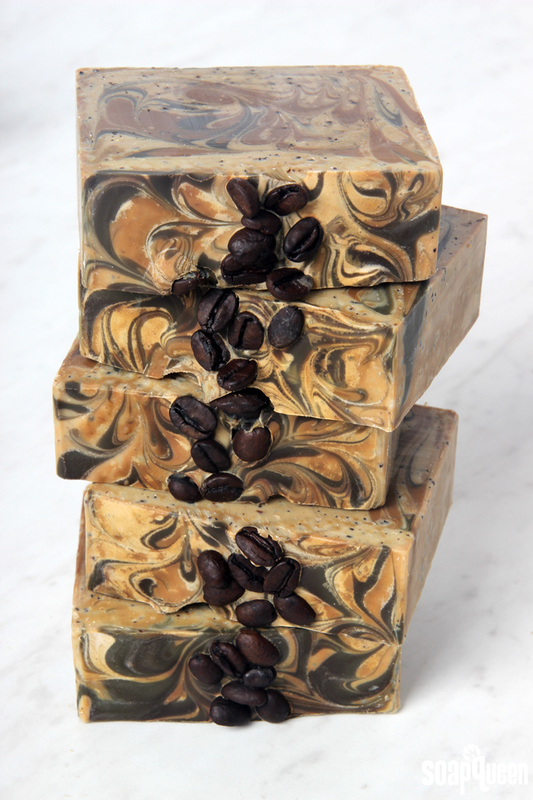 For this soap, Espresso Fragrance Oil gives the bars a rich, delicious scent. Espresso Fragrance Oil does discolor in cold process soap due to the vanillin content. Titanium dioxide combats that slightly, but you can notice some discoloration on the top of the soap in the photos above and below. Learn more about vanilla discoloration here. This soap also contains used coffee grounds. It’s important to add used rather than fresh coffee grounds. Fresh coffee grounds may bleed in the soap. The bleeding doesn’t hurt the bars in any way, but it is a cosmetic issue. It’s also a great way to use up leftover coffee grounds! Today is the second tutorial in the Back to Basics Cold Process Series. Now that we have made a basic recipe with coconut oil, palm oil and olive oil, we are adding cocoa butter into the mix! The addition of cocoa butter adds to the firmness of the bar. It also causes the soap batter to reach a thick trace more quickly. 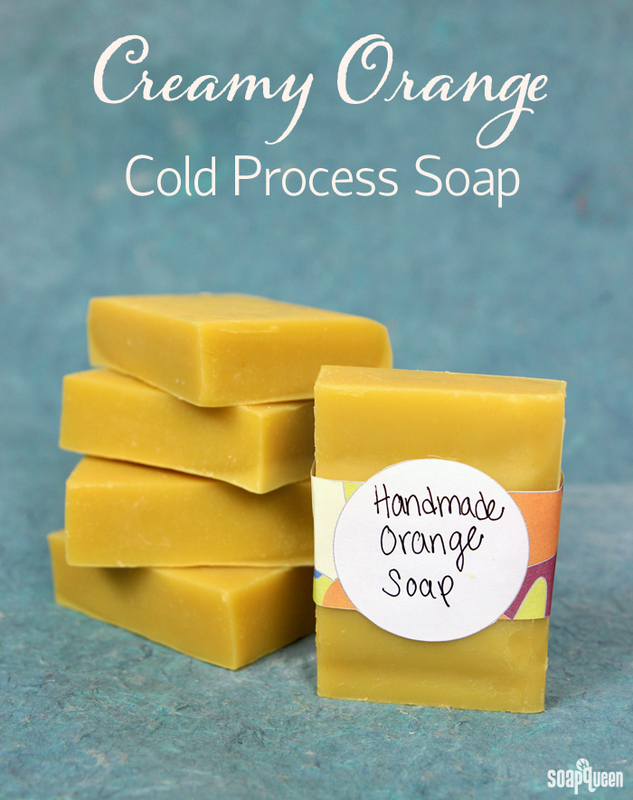 In addition, 10X Orange Essential Oil is added to give this soap a beautiful, natural orange color. The Back to Basics Soapmaking Kit includes all the soaping ingredients you need to create all four recipes in this series, including the 10″ Silicone Mold. Now, let’s get soaping! 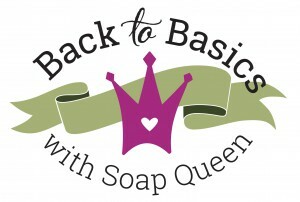 The soap bands shown above are included in the Back to Basics Kit! One of the most best parts of soap making is trying out different oils and butters. It’s interesting to see how various oils and butters affect trace and the final product. 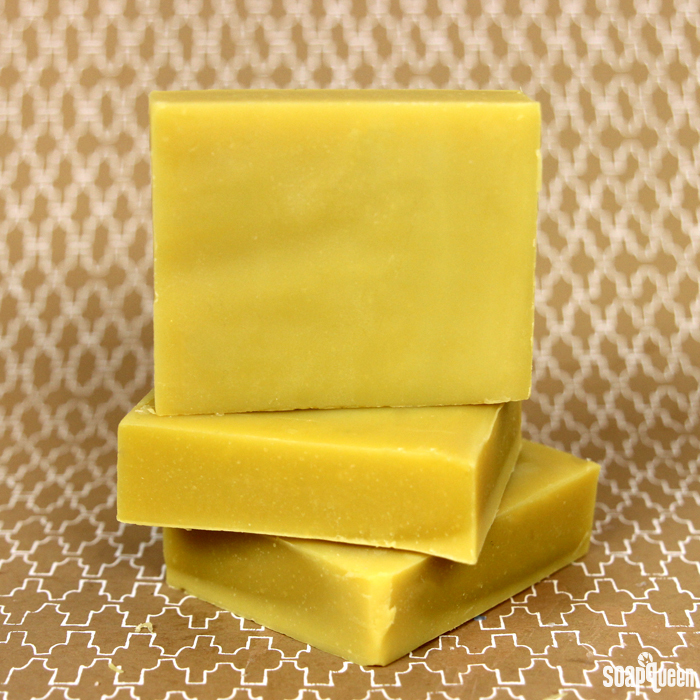 There are so many soaping oils, it can take a few batches to find “the perfect bar” for you. Everybody likes different soap properties (cleansing, moisturizing, exfoliating, etc), so it’s fun to experiment! This recipe is comprised of coconut oil, palm oil, olive oil and cocoa butter. To learn more about properties of common soap making oils, check out this blog post. The coconut oil, palm oil and cocoa butter contribute to the firmness of the bar. A large percentage of olive oil is used to give the bar softness. In addition to firmness, coconut oil also gives the bar a lush lather and cleansing properties. Cocoa butter is used at 10% for firmness and for its skin loving properties. Cocoa butter is a stable fat and also contains natural antioxidants, making it a popular choice for cold process recipes. Read more about it in this Sunday Night Spotlight. Choosing a fragrance from all the fragrances out there is a big choice! There are sooooo many good ones =) One important factor to consider is fragrance discoloration. Some fragrance oils change the color of soap due to various components within the oil. 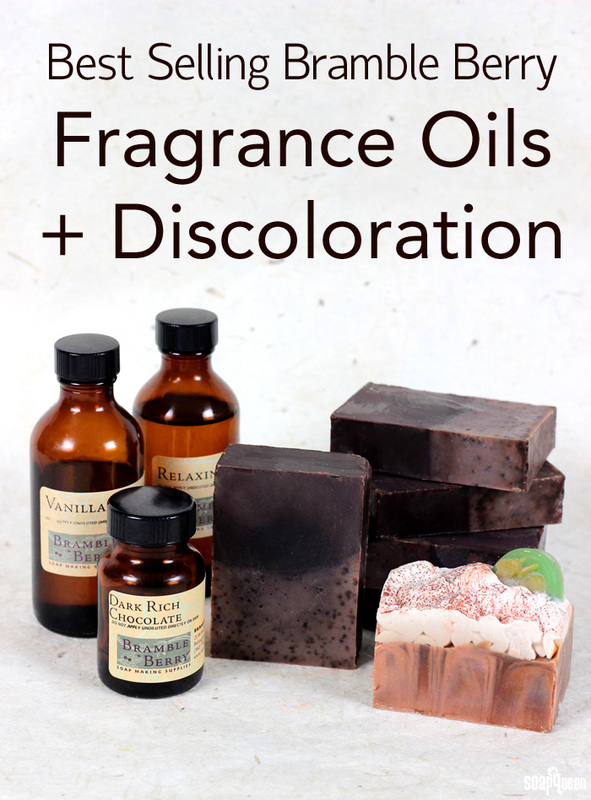 The most common type of fragrance discoloration is vanilla discoloration, which changes the soap to a deep brown. Fragrance oils can also turn soap various shades of yellow, tan, and orange. Fragrance oil discoloration can dramatically change the colors created in soap, so it’s important to choose your fragrance oil (FO) wisely. Vanilla discoloration is a natural occurrence. Fragrances containing vanilla notes are created with a component called vanillin, which is the primary component of the extract of vanilla bean. Vanillin is the organic compound that gives vanilla its flavor, and is widely used in fragrances to impart gourmand sweetness. The chemical nature of vanillin leads it to cause a darkening or browning, especially of white products. This effect also occurs with natural vanilla extract. The higher the level of vanillin within the fragrance oil, the more darkening will occur. Even fragrances with a small amount of vanillin content of .4% (such as Almond Fragrance Oil) will still cause slight discoloration.